How do I create an MMD walking motion? Is there any motion data for walking? 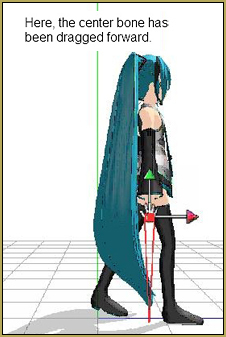 How can I make a walking motion in MikuMikuDance? In the past few weeks, I’ve had a lot of problems creating an MMD walking motion in my animations. There’s no need to go surfing the internet for hours on end trying to find a motion data for it anymore! This is because I have a solution! I looked at Reggie Dentmore’s walking motion, and tried to re-create it. A few failed attempts (about 5 to 10), a few changes, and finally, I (hopefully) perfected it! Start at frame 0. 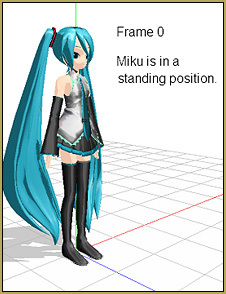 Put your MMD model (in my case, this is Miku) in a standing position. Make sure to register this, or things could go horribly wrong! To register, just click on select all and click the register button in the bone manipulation box. At frame 25, select the leg IK_R bone that’s located at the base of the heel (it doesn’t matter if you are selecting the left IK bone or the right one). This bone controls the leg, and we are going to use that to our advantage. 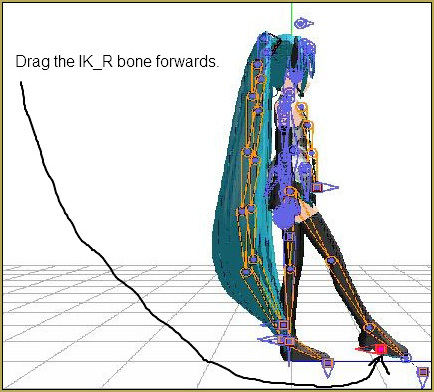 Drag the IK_R bone forwards, so that the leg stretches out. Register this. Also, be sure to register the other IK bone, IK_L, that you’re not using in it’s place, otherwise it’ll look like your model is skating rather than walking. Select the center bone, and move it forwards, so that it looks like your model’s center is about to go over her knees. Register this too. Go forward another 25 frames and repeat the steps, but do it with the other IK bone instead (if you were using the right bone, switch to the left one and repeat the steps. Same as if you were using the right bone)! Be sure to register the old foot’s position each time. 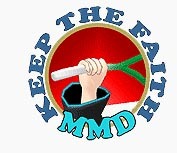 In just a few minutes, you will have a brand new (awesome) MMD walking motion! Now how hard was that? Whenever I try to add a new thing to do, like I wanted to have Miku with her head resting on her hand, and then slowly move down, once I add it, it immediately starts going down without the pause I want! Help? Lets say you are in frame zero… and in frame 60 you want her arm to be down… but you don’t want the arm to start moving down until frame 30. Start by going to Frame zero. In frame zero, register her arm position, right where it is, so you get a red diamond. Click Copy, right there under the frame chart, to put that diamond in memory… Then go out to frame 30 and click the Paste button to paste that red diamond into frame 30. … Go out to frame 60 and make that arm-down pose… and register so you get a red diamond. Now when you click PLAY, the arm stays still until frame 30 (because it has the same setting as frame zero) and then starts moving to that frame 60 position. … Got it? Each motion has a set-up to control the timing. Thank you so much! It kept doing that and I wasn’t really understanding why.